I recently wrote about what I called Cyberlife, the third wave of the Digital Age. I was very happy to see that some presentations at the DES2018 in Madrid confirmed my insight and provided other perspectives about it. We are on the same page as there are clearly three waves under the overarching concept of Digital Age. These waves are based on revolutionary technological developments according to IBM and David Farrell, general manager of IBM Cloud Watson & Cloud Platform. He organised the three waves based on some classic laws of the Digital Age: the first is a very known law that describes the doubling of microprocessing power roughly every two years (Moore’s Law, after Gordon Moore, from Intel). This a typical law of the cybernetics world. The second is Metcalfe’s Law, which states that the value of a telecommunications network is proportional to the square of the number of connected users of the system (n2). I had the pleasure to attend a conference with Robert Metcalfe in Brazil many years ago, he was a truly visionary. This is the law that governs the Cyberspace. Finally, as a third trend emerges with AI. 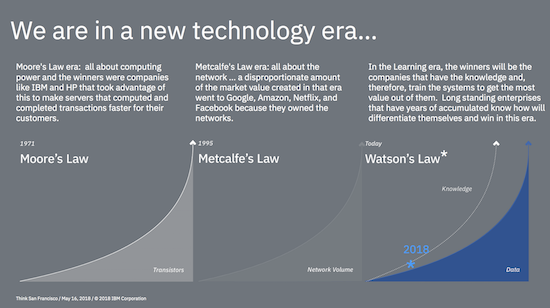 IBM describes its effects with another law/principle, the Watson’s Law, named after the company’s founder and its supercomputer. Currently the term is not fully adopted but this is the postulation and suggestion of IBM at this stage, which relates to the use and application of AI in business, smart cities, consumer applications and life in general. It makes sense, no doubt, and for me it is basically the Law of Cyberlife. For his part, Antonio Marín Rivals, director of KPMG in Spain, focused on creating value in the digital economy. For him, companies seek to offer an omni business experience to their stakeholders. 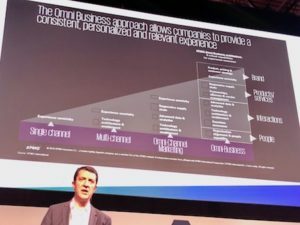 I found KPMG’s division of omni business in four layers very interesting: Brand, Products and Services, Interactions and People. Marín Rivals pointed out that the role of people is key in this process of dramatic change that we are going to observe in the coming years with the increasingly digitalisation of every aspect of a company. Technological changes will influence internal and external operations, therefore they will also affect employees and consumers. The workforce and the marketplace are changing. New technologies will create new channels; new relationships will result in new behaviours. I thought it was very interesting, in this sense, the slide presented by Scott Brinker, from Hubspot. Zooming in in the marketing area, he brought us a more specific law: the Law of Martec. 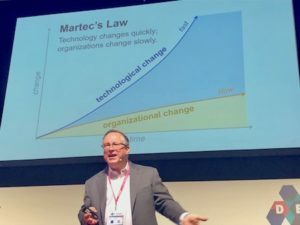 Basically it describes that organisations change at a logarithmic rate, while technology advances at exponential speed. This explain one of the reasons why the challenge of marketing departments is so daunting to adapt to the new reality of a highly-intensive data-driven marketing. These departments are basically running against the clock and consequently capability-building and attraction of talent are high-priority items in the CMO agenda. These different conferences indicate that there is a fundamental aspect of marketing decisions in the Digital Era that cannot be neglect: People. This reminds me Forrester and its POST method of digital strategy creation : people come first, then objectives, strategy and in the end the technology.